For the past couple of years Intel has used MWC as an opportunity to update us on its mobile plans. This year is no different as Intel officially launches its latest LTE modem and first 22nm smartphone SoC. Intel is announcing their 2nd generation multi-mode LTE modem at MWC: the XMM 7260. Brian already went through and did a great job explaining what the 7260 is and what it's capable of in his article from last year. In short, the XMM 7260 is Intel's first category 6 LTE modem with support for carrier aggregation. The 7260 is paired with Intel's SMARTi 45 transceiver that enables single-chip CA. On paper the 7260 is a competitor to Qualcomm's forthcoming 9x35 modem, however it's built on TSMC's 28nm process compared to the 20nm node that Qualcomm is using for 9x35. Intel claims its architecture is extremely power efficient despite the foundry disadvantage (an admittedly unusual position for Intel to be in). It will take Intel 2 - 3 years to bring its modem manufacturing in-house. The XMM 7260 is presently going through certification at tier 1 mobile operators and Intel expects devices on shelves in Q2 of this year. The XMM 7260 is a very important product for Intel as it hopes to put a dent in Qualcomm's almost exclusive dominance of the LTE space. By the end of 2014 Intel hopes to be the obvious second choice behind Qualcomm. While it's not incredibly common to talk about pricing, I suspect that's going to be an advantage that Intel hopes to exploit over Qualcomm. As the new comer (at least to LTE) with everything to prove, I'd expect Intel to offer XMM 7260 at a discount to what Qualcomm charges for its alternatives. Intel being the value player may be unique in its silicon business, but it's not unique in its role in mobile thus far. The 3G XMM 6260 was widely used by many OEMs as it was an incredibly reliable, and cost-effective solution. As growth in smartphone markets shifts to lower priced products, Intel being more of a value player might work out. That being said, at lower cost price points OEMs typically prefer an integrated solution with AP and modem on a single chip - something that Intel doesn't presently have a solution for. You'll first note the lack of any purely high-end offerings. Intel is aiming squarely at the performance and mainstream segments. This is in stark contrast to Intel's position in the PC industry where it has offerings across all segments, in mobile Intel hopes to begin by competing outside of flagship devices and being more of a value player than it's perhaps used to. In the first half of the year, Intel will bring out Merrifield - this is the dual-core Silvermont based SoC that's effectively the phone version of Bay Trail. Despite being aimed at the performance and mainstream segments, Intel expects it to be performance competitive with Qualcomm's Snapdragon 800 and Apple's A7. 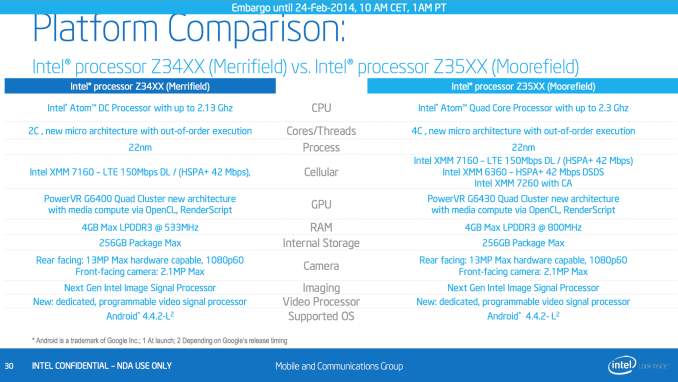 On the modem side, Intel hopes to pair Merrifield with the XMM 7260 LTE modem. In the back half of the year, Merrifield gives way to Moorefield - this is a quad-core update to the SoC with enhancements to the graphics and display sides. Just as Qualcomm is under pressure to play in the core race, it seems Intel is too. Cherry Trail is the 14nm update to Bay Trail, featuring Intel's Airmont core (14nm shrink of Silvermont) and a substantial boost in graphics performance (Gen8 graphics, 16 EUs). The only member of the value segment is Intel's SoFIA. This is an SoC that comes to Intel by way of the Infineon acquisition. The original design featured a low end ARM CPU, but Intel modified it to instead use Intel's Silvermont cores. It's important to note that Intel's entire mobile roadmap is 64-bit enabled. There are no 32-bit only cores in Intel's mobile future, and Intel's Android development has shifted entirely to a 64-bit focus. Both Merrifield and Moorefield are built on Intel's 22nm SoC process, bringing mobile parity with the rest of Intel's businesses. The parity won't last for long in phones as Intel is expecting to begin its 14nm Broadwell later this year but it's a much better story than it used to be. Merrifield features two Silvermont cores sharing a 1MB L2 cache and running at up to 2.13GHz. Moorefield doubles both core count and cache size, while increasing max frequency to 2.3GHz. Intel continues to follow the industry's terrible lead and quotes max turbo frequencies rather than base clocks in its marketing materials. Intel continues to embrace the hipocrisy of all mobile SoC vendors and advertises max CPU clocks rather than a true base clock. Just like Bay Trail, Merrifield and Moorefield can share TDP between both the CPU and GPU cores. I have to say that I'm pleased we're dealing with no more than two SKUs per family this time around. I would like to see Intel reduce that to a single one but once Moorefield displaces Merrifield I'll be happy with a two SKU stack. While Intel uses its Gen graphics in Bay Trail, the GPU in both SoCs is still from IMG. Merrifield features the PowerVR Series 6 G6400, while Moorefield uses the G6430. Both are four cluster designs, the latter is just optimized for higher performance. This is roughly the same GPU configuration Apple uses in the iPhone 5s/iPad Air, but at somewhat higher frequencies from what I can tell (and of course, built on Intel's 22nm process and not Samsung's 28nm). The ISP is all new compared to CloverTrail+. The new ISP tops out at 13MP/2.1MP, which does put it behind the latest from Qualcomm in terms of max supported sensor resolution. Both SoCs integrate a sensor hub akin to Apple's M7 for use in low power monitoring of sensor data without drawing a lot of power. Intel isn't talking much about video encode/decode, but it's important to note that there is no hardware accelerated H.265 decode as far as I can tell. Merrifield presently supports Android 4.4.2 and Intel expects it to support the L-release of Android when it's ready. Intel shared a bit of Merrifield performance data, although we weren't able to run any ourselves. Intel's data puts the dual-core Merrifield CPU performance ahead of Apple's 1.3GHz A7 by 16% in WebXPRT. Given how close the Bay Trail/A7 performance race was, Intel's numbers sound believable here. Intel is also claiming a similar GPU performance advantage compared to the A7. I think it's very telling that Intel no longer seems to have any issue making direct, public comparisons to Apple hardware. It wasn't too long ago that Intel shied away from doing just that. I don't believe this says anything about the Intel/Apple relationship, but perhaps it says something about the intended target for Merrifield. In the past Intel may have hoped to win Apple over, but Merrifield appears to be a design aimed at those who wish to compete with Apple. 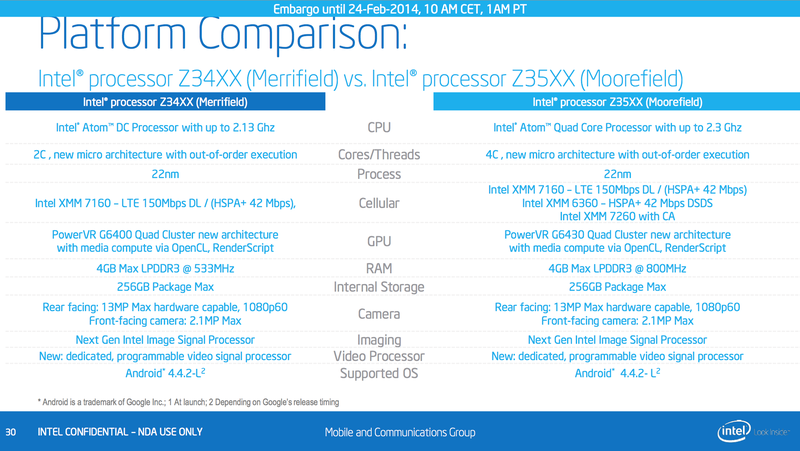 As I mentioned earlier, Intel's entire 2014 lineup of mobile SoCs are 64-bit enabled. Intel shared a little bit of data on the peak performance improvement you can expect to see from applications recompiled in x86-64. Google has yet to share its 64-bit Android plans, at this point all 64-bit Android demos are using vendor recompiled kernels and nothing official from Google. I expect this to change at some point this year, it's just a question of when - a question that will likely be answered at this year's Google IO. Power is very important when making any performance claims, and Intel is similarly bold with its power efficiency claims. I haven't used BatteryXPRT, but it comes from the same family of mobile benchmarks that Intel loves so dearly. I'll reserve final judgment until we see power data in a broader set of battery tests, but I would hope that at 22nm Intel is able to pull a win here. Merrifield is an important process and architectural update to Clover Trail+. The move to Silvermont cores puts Intel in a very different performance position, and embracing IMG's PowerVR Series 6 (Rogue) GPU modernizes Intel's GPU story. Intel also has a much better modem story than ever before. For the first time since Intel started its quest to make it into mobile, there's a fairly solid looking modem and AP story. The only thing left is to actually get a meaningful smartphone design win. I suspect if Merrifield were available in a good chassis today (Moto X, G2, Nexus 5, etc...) it would make for an excellent device. Intel seems fine with not pursuing absolute performance leadership, but it appears to have built something competitive. Depending on where Intel prices Merrifield, it could provide quite competitive on the CPU side when pitted against Qualcomm's Snapdragon 610/615. The issue here remains one of design wins, not one of technical proficiency. Intel's problem past the current generation isn't with tech. But Pricing. How are these Merrifield priced? Like I have said the high end market are dominated by Apple SoC, Samsung's SoC as well as Qualcomm. Which leaves very little space for other OEM racing to the bottom. "3G XMM 6260 was widely used by many OEMs as it was an incredibly reliable, and cost-effective solution"
May be i haven't been following closely, Which OEM uses it? So I'm typing this from a Bay Trail tablet. And I promise you that its faster than anything but a top end iPad Air, and is not as uncommon as you think. I'd buy a bay trail tablet myself if only there was one not deliberately crippled to only 2 gigs of ram. I've tested a few bay trail products myself, and despite your promises, it is ONLY competitive to current gen arm products, and ONLY in terms of CPU performance, whereas GPU performance is more like on par with low end arm chips. And arm chips are scheduled for a big performance bump this year, which will widen the gap between arm and atoms even further. I need more ram for productivity too. 2 gigs is not enough, for example, 2 gigs with VS you will only be able to compile very small projects. I went the longer way - got a note 10.1 with 3gigs of ram, built GCC for ARM HOST and DEVICE myself as well as all needed libraries, and I can assure you, note 10.1 with 3 gigs of ram beats bay trail with 2 gigs of ram BIG TIME. Not only is compilation time significantly better, but I am able to compile projects which fail to compile even with 4 gigs under windows with VS, much less with 2 gigs.